Home > Cars > Auris > Auris Hybrid press launch: we need you! Auris Hybrid press launch: we need you! We were lucky enough to see the new Auris Hybrid for real at the Geneva motor show. Now, we’re going one better – we’re packing our bucket and spade (okay, camera and laptop) and heading off to the official press launch in Barcelona from 18-19 May. Along with a handful of well-known motoring journalists, we’ll be driving Toyota’s first full hybrid hatchback for the very first time. We won’t just be there for the test drive and tapas, though. We’ll have access to Toyota’s chief engineers and product managers, and we’ll be able to ask them your questions about the car and Toyota’s Hybrid Synergy Drive technology… Submit your questions by commenting below and let us do the legwork for you! Remember to check back next week, when you’ll find the answers to your questions right here on the blog. Update 20/5/10: We have now published some of the answers to your questions. Click here for the first post of answers. 21/5/10: Part 2 can now be found here. Auris Hybrid press launch: we’re off! When will we be able to see demo models in showrooms & when can we order? In the publicity it states that the batteries will last the lifetime of the car. This is a bit like signing up for broadband which is subject to fair usage. So (1)What is the “lifetime of the car” (2) What is the manufacturers guarantee in years / miles (3) If the batteries have to be renewed out of the guarantee period what is the cost. We really don’t know the lifetime yet. 2nd generation Priuses haven’t had many battery replacements. I regularly see an ‘X’ plate Japanese import, original, Prius, as I drive to work. US owners are reporting replacements required at 120,000 – 180,000 miles, and about ten years of age. The Prius hybrid/battery warranty was reduced to 5 years, 80,000 miles for the new model, from 8 years, 100,000 miles on the previous model. In California a 10 year, 150,000 mile warranty is mandatory for Toyota to qualify for clean car credits. The list cost for a 2nd generation Prius battery in the US is currently $2,588.67, but one source discounts to $1,967.39. Many owners are sourcing batteries from breakers, where necessary – there are more crashed cars than demand for batteries. By the time it needs replacement, the new battery may cost more than the car is worth, so ‘lifetime of the car’ may be accurate. What are the servicing requirements? Is the car suitable for my type of commute that consists of country lanes, B roads, dual carrageways as well as town driving? Servicing is primarily oil and filter changes and brake fluid changes. Coolants last quite a long time as does the transmission fluid in the transaxle (it’s not really a ‘gearbox’). No shifts means no wear. Electric power steering is maintenance-free. Oil and air filters are common to other Toyotas using the ZR family of engines. 0W20 oil is a little hard to get hold of but is available from other suppliers. I commute from Reading to Cookham (near Maidenhead) using a mixture of roads, primarily the A4. In my Gen 2 Prius I’m getting about 58mpg – the display is a little optimistic at 59.9. The EU standard test result is 65.7mpg for this car. what price range will they be in and will they be manual transmission? I consider myself a light user of the brakes by driving carefully and anticipating hazards. Does this mean that I would get less benefit from the hybrid arrangement? You would probably do better than someone who constantly brakes and accelerates. The hybrid system likes running at constant speed and load. Regenerative braking is over-egged – you lose more energy to wind drag than you can capture in the battery and then you lose even more energy as you accelerate. Similarly you use more energy climbing a hill than you regain descending it. Toyota’s hybrids get great results by having an efficient engine running in its efficient zones. Regen is better than throwing the energy away, but even better is not to accelerate excessively in the first place and to glide to stops. Why have they made it look so very BORING? My first question is one of prices, What will it be for the Auris Hybrid ? Will the car have a auto gear change ? I enjoy driving a 2002 Avensis with cavernous boot space but am considering a change for running costs and environmental reasons. How big is the new Auris boot and can the back seats be folded to create more luggage space? Will there be parking sensors as standard? OR are the sight lines lower? The question is about payback period. Based on the likely on the road retail price and the Real world MPG figure (not the published figure). What is the pay back period against the equivalent Auris over 12,000 miles/annum with 1/3rd being around Town and 2/3rds main routes and M-ways. What does the luxury pack include? Bluetooth not available if luxury pack specified; does this mean bluetooth is already included in luxury pack? How much boot space is lost by the box-like intrusion seen in photos? What is inside it? Has this model got multi-link rear suspension? Have cabin noise intrusion and in-cabin rattles been improved over previous generation Auris? Is there a foot rest to the right of the accelerator pedal (on RH drive cars) so right foot can be ‘parked’ in a position close to the pedal when using cruise control? (I don’t like the idea of having my right foot below the pedals when using cruise control as it delays ability to react quickly). How effective is the ‘B’ position of the gear lever at providing engine braking? Does it control speed on steep downhill descents? (I currently have Golf with DSG gearbox where I can use tiptronic to select lower gears). What has been learned/applied since recent events relating to Prius models not being able to be stopped? Some of your questions are answered in the press release: http://www.toyotagb-press.co.uk/protected/vehicles/releases/2010/60638toy.htm. That also answers your second question. No mention of heated seats. The box intrusion in the boot is presumably a larger underfloor box. The high-voltage battery is very likely mounted directly behind the rear seats and therefore raises the floor level, and this box carries that raised floor level all the way to the sill. The box is present in all models of Prius and contains nothing at all except for a couple of tools. You can use it for extra storage. Multi-link rear suspension isn’t offered on any other Auris, or even on the Prius, and since that’s a key feature of the upcoming Lexus CT200h, I think it’s unlikely to be offered on the Auris HSD. The ‘B’ position is very effective at controlling speed on steep downhills. It’s similar to selecting 2nd on my old Focus. I’m not sure what you mean with your last question. There was a software change for braking to cover a dip in braking performance when switching from regen braking to friction braking if the front wheels lost traction then recovered it quickly. The events where people claimed unintended acceleration were found in one case to be application of the wrong pedal, and in the other was strongly believed to be fraud. Q. Because this is new technology how much support is there from toyota . Whilst I understand that new technology is always expensive, Toyota have been making the Prius for some years. Why are the prices of hybrid cars still so much higher than standard cars? Surely, now you are making a further range in Toyota, together with many Lexus, the manufacturing costs should come down? If so, why can hybrid not be made more cost-advantageous to more customers? What price are you aiming at and what spec levels are on offer? Can I expect similar refinement as in Prius? 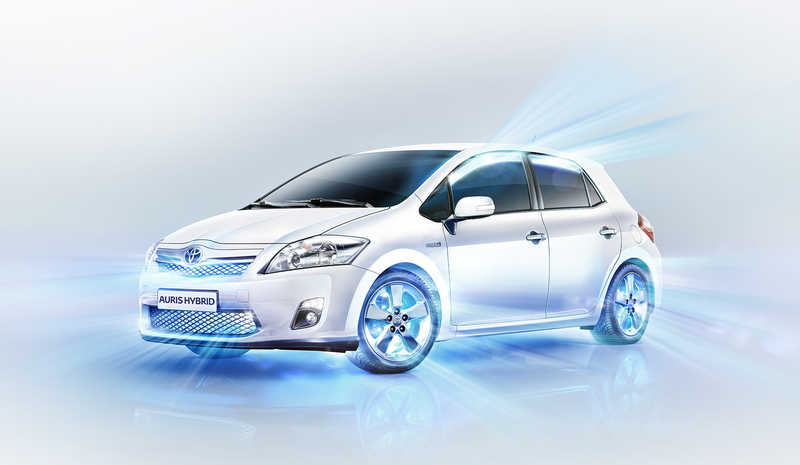 Will Auris Hybrid be available in equipment grade similar to Prius T Spirit? Will Toyota at all be looking into producing a Diesel Hybrid to rival the Peugeot 3008 expected to go on sale next year? How will the new Auris Hybrid compare with the Honda Insight Hybride. Based on a Model price/feature Line up? I drive a 08 Auris 1.4 Diesel and I am considering buying either the Prius or Auris Hybrid. Please ask if Toyota plans to update Aurus to a plug-in hybrid equipped with the Li battery and if yes, when this car is expected to be on sale. howcan you prove the boast of 74 mpg ? and will this show up with a test drive ?? All cars are tested to standard test parameters and driving cycle mandated by the EU. They are actually tested by the manufacturers but the results may be audited and manufacturers have been fined for submitting, shall we say, optimistic results. 74mpg – or more accurately, 3.8 litres per 100km, as the testing is done in metric, rounded to 0.1L, then converted to imperial for the British market – is the result of performing this testing. The test is quite weak, particularly compared to the US EPA tests, because the speeds are pretty slow and the acceleration isn’t hard. There is only a tiny burst of 75mph driving, most of the extra-urban test happens below 45mph. Also, it’s done in very warm conditions (20 to 30 degrees Celsius) on a perfect rolling road, though aerodynamic drag is accounted for, and air conditioning isn’t used – nor is heating. However, that’s the test we have, and to reduce the efforts of marketing weasels, the manufacturers are only *permitted* to advertise the results of this test. It very likely will not be possible to reproduce this with a test drive. Try to finish your drive with the same level of charge in the battery as when you started – this isn’t hard, the car tries very hard to keep the battery at about 75% and will burn extra fuel to get it there more quickly if you overuse electric drive. Your actual fuel economy over time depends on your driving style and the conditions you encounter. Mine is 56.5mpg over two years – 57.8 over the last year – in a 2nd-generation Prius, about 14% lower than stated. Your conditions might be more or less suited to the car than mine. The car has fantastic potential to the Market, is the car all hype, or is this actually a Hybrid Hatchback that will be pitched accordingly with regards pricing or is it going to be just another over priced ‘Green’ car. Is there likely to be a luxury version of this or any other small model? I would like to buy a small vehicle with green credentials without sacrificing leather upholstery, air conditioning, heated/cooled and electrically operated memory seats, satellite navigation, reversing camera, parking sensors, rain sensors, cruise control, bluetooth, heated steering wheel, heated door mirrors. These only seem to be available on large vehicles. Could they be made optional extras on a smaller car? How does the cost of servicing a hybrid compare with that of a conventional car. Can we have details of the various options and their equipment levels, colours and of course pricing. When will the hybrid model of the Auris be available in the U.K.?